1 answers Hi, I have your knob P-K314-1 with out screw? If you ordered a knob and it did not come with a screw, please contact customer service at: custservice@amplifiedparts.com. 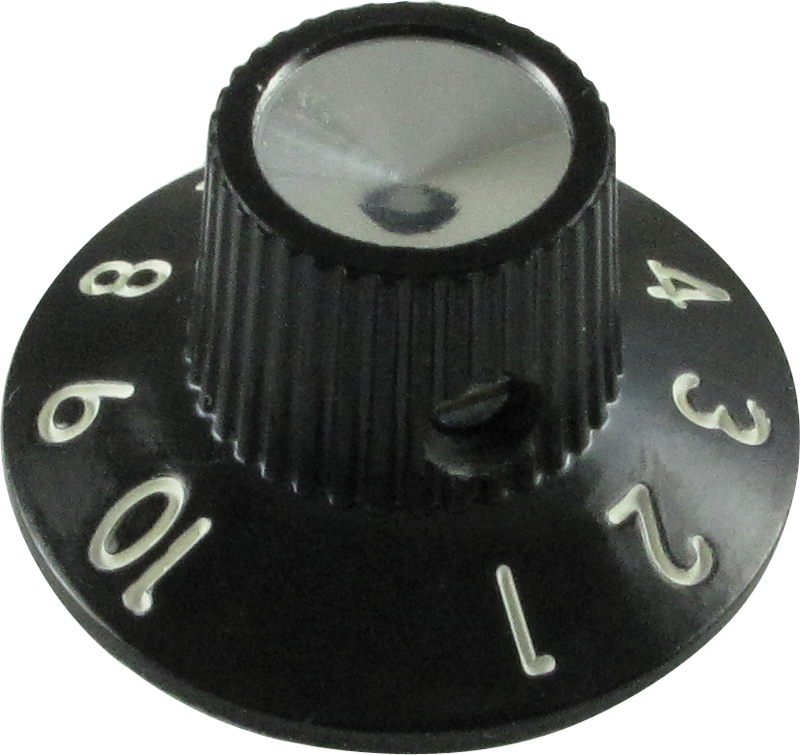 1 answers Do you have these knobs for a 63 Fender Tremolux amp in blonde/tweed? Brown with tan numbers? 1 answers Where are these made? These knobs are made in Taiwan. Knobs were used on a Fender Twin Reverb 1977. They worked perfectly. This product is a reproduction product. Appearance wise it looks nice and in most applications will provide reasonable match. However, these are not true to authentic pre-CBS Blackface. The formulatiion of plastic is much different, the diameter of the knurled barrel is ever so slightly smaller. The numbers stamped upon the skirt is slightly different. The most noticeable font difference is the #"8". Original knobs have a metal bushing that is encapsulated within that the set screw threads into .This knob has a plastic bushing that is pressed into the knob and the setscrew tbreads are cut into the plastic bushing. A great value replacement that I used to restore a customer's 1967 Fender Champ. Made it look like it did back in the day! Actually an exact match to the ones that were on my early 70's Silverface Pro Reverb. Ordered some Fender skirted knobs for my 1967 Pro Reverb amp. The knobs fit and look identical to the original equipment knobs. Very good match. Look perfect on my '68 Bassman! Same as the originals. Work great. Best price.